Have you ever finished playing or practicing your instrument, or come out of a gig, with your ears ringing? If so, you could be storing up long term problems for your hearing. Tinnitus (an unexplained ringing or buzzing in the ears) is a common condition among musicians and, though often temporary, can be an early sign that your hearing is getting damaged and so should not go unchecked. 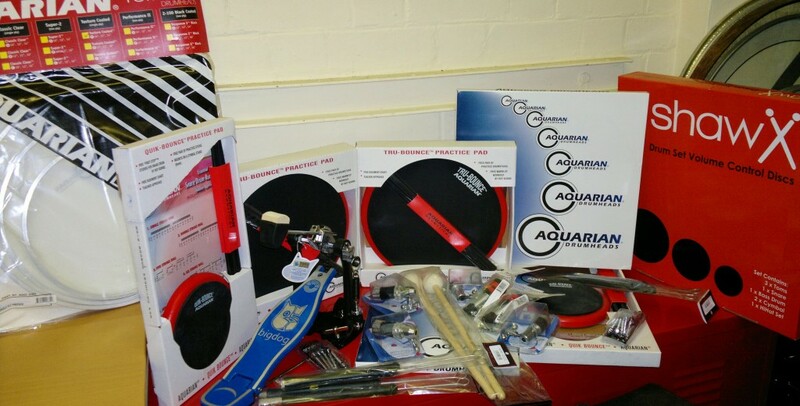 New Aquarian, Big Dog and Shaw Sticks accessories arrive! Visit the shop page for more details and to arrange a viewing. Dye House Drum Works: a Rockschool exam centre in Leicester. I’ve been teaching the Rockschool syllabuses pretty much since they started out, on a machine cassette-based audio format (true!). Since then, they have displayed a keen ambition in developing constantly relevant content and garner ever wider international recognition for their qualifications. Many of my students have benefited greatly from the structured learning these grade packs bring and indeed, have secured places on some of the country’s best contemporary music further and higher education courses with the aid of performance skills or UCAS points gained from pursuing them. Dye House Drum Works is a registered Rockschool Public Examinations Centre and runs open exam days throughout the year. See the Rockschool website for details. Or contact our drum school! I thought I might share a couple of things with you today, as this afternoon I am enjoying the music of Thelonious Monk – and his drummer of the time, Ben Riley. If you’re not familiar with Monk’s work, check him out. In terms of jazz greats, he’s right up there and really is someone with whom all musicians should become at least aware. Practice time is often at a premium, so I thought I would offer a few words and ideas on getting the best out of the time you do have. Here’s an interesting and fun rhythmic concept, accessible to players of all levels: ‘Beat Displacement’. I’m going to reference this directly to an equally engaging and highly musical tune: Herbie Hancock’s ‘Cantaloupe Island’, which features the genre-defining talents of Tony Williams on drums.